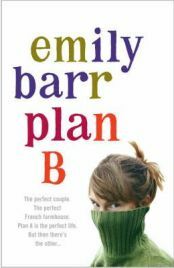 I have read most of Emily Barr’s novels and each one is fresh and enjoyable and you think they can’t get any better. However, having just read Plan B, they do get better and I was totally absorbed in this story from the moment I picked the book up! Emily Barr is such a good storyteller and she hooks you from the very start so that you don’t want to stop reading. I found myself snatching odd moments in the day to pick this book up, and now that I’ve finished it I’m almost disappointed as I didn’t want to stop reading. The main character in the book is Emma and over half of the story is told from her point of view and is written in the first person. At the beginning when we first meet Emma she is reluctantly moving to France to start a new life with her partner Matt and their two year old daughter Alice. They have bought a ramshackle house in a quiet village to do up and it all looks very daunting. It also doesn’t help that Matt has to work away in London half of every week leaving Emma to look after Alice, and deal with builders, tradesmen and local schools. The reader learns very early on in this book though that Matt has not been entirely straight with Emma and there are many aspects of his life of which she has no idea! The story follows Emma throughher initial settling in France, her discoveries about Matt and her struggle to cope with what she has found out. It’s a very moving story particularly as we have to watch Emma fall apart. It also shows the very extremes of being in love and what happens when that love is not enough. Emma experiences such strong emotions throughout the story – love, hate, mistrust, jealousy, lack of self worth and so on. All are portrayed so well in Emily Barr’s excellent style. It makes for really good reading. There are a number of interesting characters in this book and they all are very believable. Emma is extremely likeable and I doubt that there are many readers who would fail to sympathise with her. Emma’s family provide her with a lot of love and support and there are a number of local French and English people who add a touch of colour. The story itself is quite complex with a lot of interweaving of themes. It’s all worked through very well though and we are not left with any loose ends. It also works well with some chapters being told by Emma and others by a third person narrator. This is also essential to the story because it enables the reader to know things that Emma is yet to be aware of. Overall this is one of the best books I have read in a while and as I said earlier it was quite unputdownable. All the while I was reading I was anticipating what might happen next and almost holing my breath as events started to unfold. I found myself very much on Emma’s side and rooting for her through all her struggles. This great book has just under 450 pages and I’m sure it could have been twice as long! No Comments on "Plan B"